The complement punishment model of synapse elimination in the developing visual system. The punishment model proposes that strong synapses (blue), which are effective in driving postsynaptic responses, actively punish and eliminate nearby weaker, less-effective synapses (red) by inducing two postsynaptic signals: a local protective signal and a longer-range elimination or punishment signal (Balice-Gordon & Lichtman 1994, Jennings 1994). In the developing retina, complement is hypothesized to be upregulated in sensory neurons by unknown signals from immature astrocytes. An astrocyte-secreted factor (Factor X) upregulates C1q expression in postnatal retinal ganglion cell neurons (RGCs), which leads to deposition of C1q and the local activation of the classical complement cascade (cleavage of native C3). 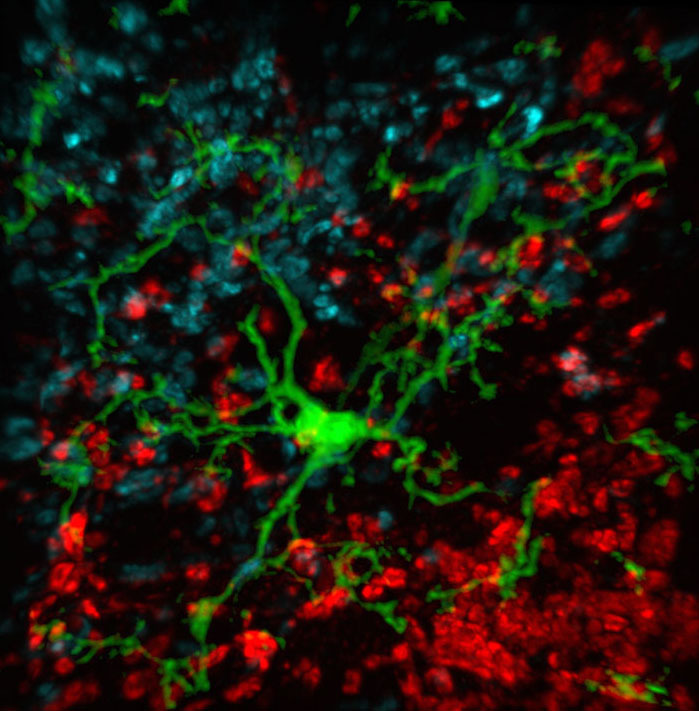 Synaptic deposition of activated C3 fragments (i.e., iC3b) could punish less-active retinogeniculate synapses (red neuron, right) of dLGN relay neurons in the thalamus (target). Activated microglia, which express high levels of CR3/cd11b, actively eliminate iC3b tagged synapses via CR3–C3-dependent phagocytosis. Strong synapses (blue neuron, left) may be protected from elimination by complement regulatory proteins or other activity-dependent protective signals) (Stephan et al., Annu. Rev. Neurosci. 2012).